Puchong, 10 Jan: The Deputy Prime Minister is not amused by recent criticisms of the MACC, apparently. 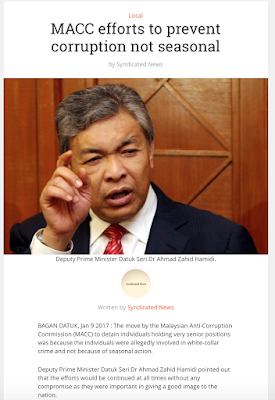 In the Bernama report MACC efforts to prevent corruption not seasonal, Zahid Hamidi said the anti-graft commission's new leadership is committed to nab the corrupt. “The (recent) arrests by the MACC were measures that translated the government’s commitment, especially the new MACC leadership, that not only small fries were nabbed but the big sharks too were also eliminated." . Zahid "placed strong confidence in the MACC leadership led by its Chief Commissioner Datuk Dzulkifli Ahmad and ... Datuk Azam Baki, who is responsible for operations". Zahid, who is also Home Minister, made the strong remarks a couple of days after a usually government-friendly newspaper wrote an unfriendly editorial on the MACC. We're all for press freedom but in view of the string of arrests the Commission has been making in recent weeks, the tone of the editorial does seem a little unusual. As the blogger A Voice aptly puts it, "... the MACC should not be abused for political agenda, be it against the opposition or a certain past leader and his band of "friends" or competing groups within the ruling party." Wallahualam. Your big pink-lipped hippo shark/whale blom kena pon? first of all who are you kidding ? we are all malaysian, we know. nobody believe those who are captured are the top of the pyramid. we all know their big bosses are still roaming around freely and proudly saying stuff as if they didnt belong in the same group. in the end the so called jerung isnt even at the top of the food chain. hence i conclude. until the top crooks are caught, sprm are just wasting people money and time. u captured the goons, the bosses are just gonna replace them with someone else. corruption will never be eradicated at all. sprm will always have to do the same thing over and over again. you do not eliminate the root of the problem, u r not gonna solve the problem at all. its gonna be the cycle over and over and over again = waste tax money & time. hell, why bother, just disband the sprm. u r writing this to convince who, exactly ? Mr president of Malaysia tak kena la zahid? You laa kat In malaysia ada Mr president. You Sudah gila la zahid? Mau bikin Komedi la bro?